Sporting a visible oven burn on her forearm, Crystal Maderia told me, "I feel like my job is to collect the highest-quality food available and feed it to my community." Now she has a new venue for that mission. 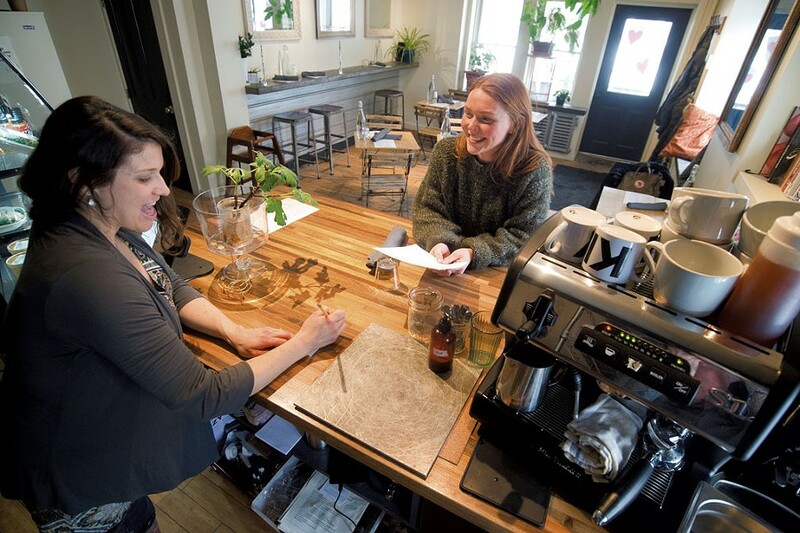 Owner and chef of Montpelier's Kismet for the past 13 years, Maderia opened Kizy in December on Barre Street, which she calls "a kinda LA-meets-Vermont" café. 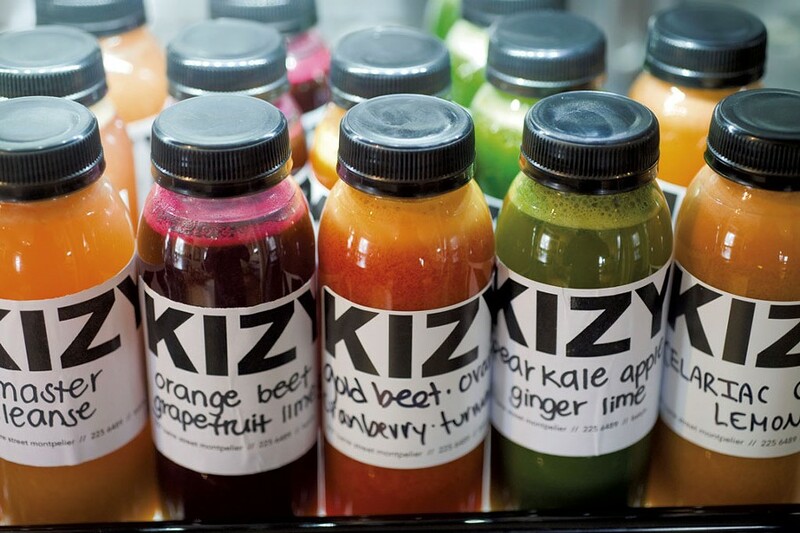 Think of Kizy as the crunchy, juice-slinging little sister to Kismet's date-night locavore gourmet. Its cuisine is suited to an impressive variety of diets, with plenty of options for vegans, gluten-free eaters and meat lovers alike. 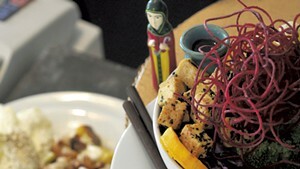 Although it's less formal in atmosphere than its big sister, Kizy's ingredients are no less thoughtfully sourced. It defines "obsessivore" in the most delicious and conscious of ways, serving nutrient-dense, vegetable-centered food made from hyper-local ingredients with love and creativity. Over her 13 years at Kismet, Maderia has established strong relationships with local farmers, who plan with her what they'll grow for her restaurants a year in advance, she said. Many of those producers can't afford to sell at wholesale prices, so she buys from them at retail prices, a markup that is inevitably reflected on the menus. "We have to deal with a stigma around being expensive. That's been the biggest challenge for me — Kismet's out of the price point for a lot of people in our community," Maderia said. Her answer to that problem is Kizy, where small plates start at $6 and a large broth bowl with veggies and noodles can ring up at $12. Most dishes at Kizy are vegan or use animal products as flavor builders, not the main focus. And Maderia sells "Kismet-quality" retail products there, including quarts of bone broth, bottled juices and frozen veggie hash. Kizy's location at 207 Barre Street was home to the original Kismet and most recently to Beau Butchery + Bar, which Maderia ran with Jules Guillemette for two years until it closed last fall. The spot isn't far from Hunger Mountain Co-op. But Maderia, herself a member, said she doesn't believe that Kizy, with its table service and more intimate environment, competes with the co-op's hot and salad bars. On the very edge of downtown Montpelier, Barre Street is lively in a different way from, say, State Street. When I arrived at Kizy at two in the afternoon, a man stood on the stoop the café shares with the next-door hair salon, drinking a 40-ounce beer from a paper bag. Maderia sees the location as an asset, refreshingly distinct from the more refined Kismet area. Inside, Kizy is cozy, with five two-top tables and a handful of counter seats. When the door to the freezer containing retail takeout is open, a polite person is inclined to wait before opening the adjacent door to the single bathroom. Though February isn't the best showcase for Vermont produce, Kizy's commitment to local and housemade was apparent. The café had run out of dandelion latte, made with dandelion root harvested by the restaurant. Instead, Maderia offered me a chaga tea made with organic milk and a touch of maple — all from Vermont, of course. The earthy, sweet, hot drink warmed me right up, and I quickly regretted ordering a small. My second drink, the choco-latte, was made with dark chocolate and ashwaganda, an adaptogen (or herb believed to have a normalizing effect on the body). I had it prepared with housemade coconut milk, which gave it a decadent, slightly vegetal taste. A rich treat, the choco-latte reminded me of a raw nut-and-date-based gooey energy ball, but hot and dressed up for winter. Buzzing back and forth between drink prep and conversation, Maderia brought me and the four other customers there at the time a sample of Core Strength, a drink made with parsley, apple, lemon, ginger, coconut milk and spirulina from Northern Spirulina in Johnson. It was bright green, creamy, tart and refreshing, with a texture somewhere between juice and a smoothie. The veggie hash was a delectable small plate made from potatoes, oyster mushrooms, a bit of Rhapsody Natural Foods tempeh, onions and a seasonal smoked veggie. This time of year, the veggie was carrots, which Maderia smoked on Kismet's stove. (Owing to size constraints, she and her staff prepare some of Kizy's food in Kismet's larger kitchen.) The hash tasted like the best campfire brunch imaginable — smoky, savory, salty and rustic. For two bucks more, I had it topped with a poached egg, its yolk the dark orange that only comes from chickens fed a nutrient-rich diet. The curly kale in the kale salad was chopped and massaged with a kimchi-and-almond butter dressing. 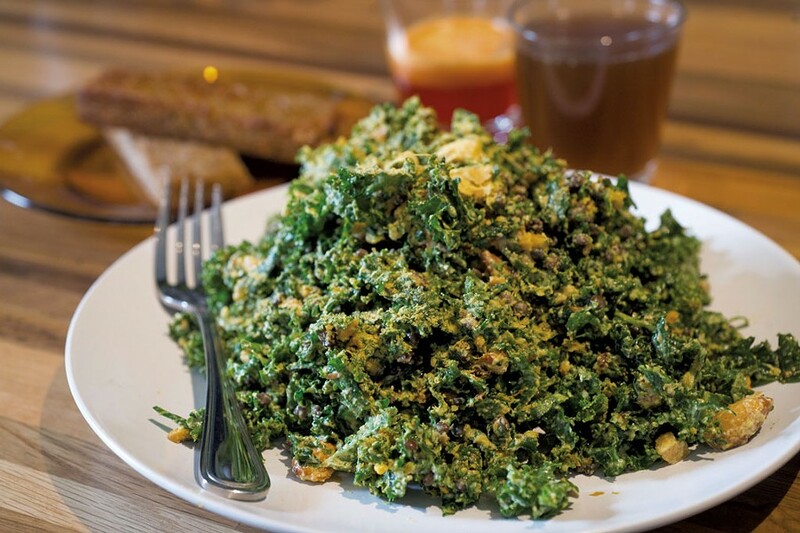 As impressively balanced in flavors and textures as the other dishes at Kizy, the salad was topped with toasted almonds, smoked French lentils, currants and the nutty-tasting spice of the hippies: nutritional yeast. Considering that the last ingredient has been abused at vegetarian cafés for decades, it was admirable to see a chef use it successfully. I had the beef bone broth with a shot of "digest tonic." Though the latter's flavors of cinnamon, cardamom, clove and orange were subtle, even restrained, they lightened up the soup considerably. Fresh dill, carrots and red cabbage floated in the defatted broth, along with millet rice noodles short enough to stay on the giant spoon without too much fuss. The chef also brought out a sample of buttery chicken broth, which got its beautiful golden hue from turmeric and ginger pulp left over from the juicer. 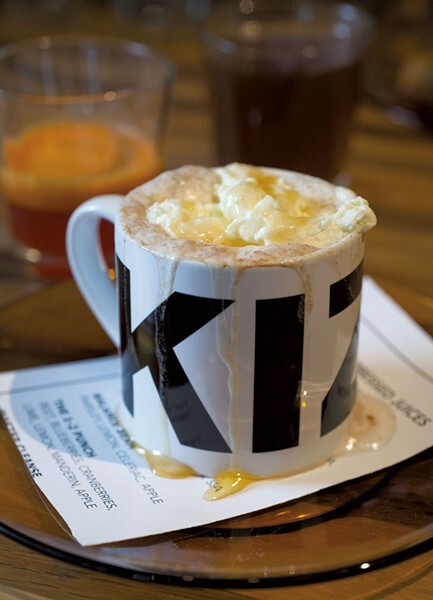 Kizy is currently open only for lunch, Wednesdays through Fridays. Maderia plans to begin Saturday brunch in mid-March, then open up the terrace, get a beer and wine license, and start weekend dinner service come spring. 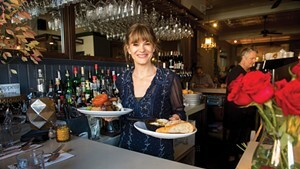 Kizy's dinner menu, she said, will focus on "summer's bounty": fresh fish, crudo, tartare, carpaccio and grilled-meat specials. When the café isn't open, Maderia is still putting the space to use, serving private dinners and making the kitchen available for others' food projects. Kizy's manager, Hailey Cohn, uses it to prep food for her catering company, Satori Foods. Home cooks can also take classes there, taught by the ever-busy Maderia. She gave a recent workshop on how to source and make bone broth; an upcoming one will focus on rendering animal fat. That's a lot of jobs for one café and one chef, but in a small space in a small town, Maderia is making the most of her flexibility. Her lease on the building runs for about three more years, she said, and she's open to seeing what directions the café and space may take. For now, she's just happy to be back in the building where Kismet got its start, enjoying a space that fosters chatting with customers. "I might forget a name," Maderia said, "but I always remember what people like to eat." The original print version of this article was headlined "Crunchy Little Sister"